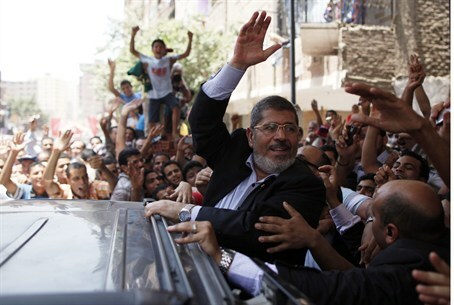 Egypt's Muslim Brotherhood pins its hopes on weekend elections to salvage its waning political fortunes. Egypt's Muslim Brotherhood pinned its hopes Friday on weekend elections to salvage its waning political fortunes, according to a report in The Associated Press. The runoff vote set for Saturday and Sunday pits Ahmed Shafiq, former President Hosni Mubarak’s last prime minister, against Brotherhood candidate Mohammed Morsi. The Brotherhood rose to become the strongest political force in parliament after elections that started in November, only to lose that power when the legislature was dissolved by court order on Thursday. The Brotherhood is now hoping to salvage its position by portraying itself as the last bulwark against the ousted president's loyalists bent on a comeback, AP reported. “Isolate the representative of the former regime through the ballot box,” a Brotherhood statement said on Friday, referring to Shafiq. It was published just before the noon deadline to end campaigning. Meanwhile, the report said, some activists took to Cairo's main squares to protest the court ruling. Morsi said on Thursday that he respects the court’s decision and added that the Brotherhood would focus on the vote instead. “We are going to the ballot boxes to say ‘no’ to the losers, the killers, the criminals,” he said, referring to Mubarak-era officials. Morsi also gave assurances that he would work closely with the country's military rulers, which are widely perceived as favoring ex-air force commander Shafiq. “As president, they will be in my heart and will get my attention. ... They will never do anything to harm the nation,” AP quoted him as having said. In earlier comments, Shafiq hit hard at the Muslim Brotherhood, warning that an Islamist victory will lead to terrorizing Christians and accusing the Brotherhood of trying to make “Palestine" the central issue for Egyptians.